Welcome to the community section of the Okaloosa SCIENCE website. In this section, we provide information on how community partners can become involved in some of our exciting programs! Okaloosa County provides the perfect backdrop for teaching STEM education to K-12 students. As one of the most biodiverse regions in the U.S., the area is ideal for using the natural environment as a way to teach science to students. The temperate climate provides year-round opportunities for exploration and experiential learning outside the classroom. In addition, local businesses and military bases attract some of the best and brightest scientists, engineers and technicians from around the country. Many are willing to share their talents, expertise and experience with students. With such an amazing educational infrastructure in place, Okaloosa SCIENCE seeks to connect the dots and utilize the educational opportunities present in the area as part of a unique, next-level STEM initiative. By utilizing resources from within and around the Okaloosa community, Okaloosa SCIENCE will help students gain a more connected and real-world understanding of scientific concepts and standards. The Initiative also brings in national partners such as the Smithsonian Institution, Harvard University, the Officer Snook Water Pollution Program, SkyTruth and 7-Dippity to supplement, enhance and expand local resources and educational opportunities. For more information on our national partners, please go to to our Partners page. In order to have the greatest success, we invite involvement from the Okaloosa community. There are many opportunities to participate – from providing field experiences and service learning opportunities for students to facilitating professional development workshops for teachers. To find out more about how you can get involved, click here. Community partners who are interested in joining the Okaloosa SCIENCE Initiative and offering support to students and schools can have their information uploaded to our Asset Map database. The Asset Map is a tool that helps educators identify and obtain resources from the community. It is designed to be a "one stop shop" for community-based resources, containing information on community partners and the supports they offer. Teachers access the Asset Map through the password protected "Teacher" section of the Okaloosa SCIENCE website. The database is searchable by fields such as type of support offered and subject area. Contact information is provided so educators can get in touch with a community partner directly. The Okaloosa SCIENCE team will assist community partners in uploading their information to the database. For more information on the Asset Map, click here. 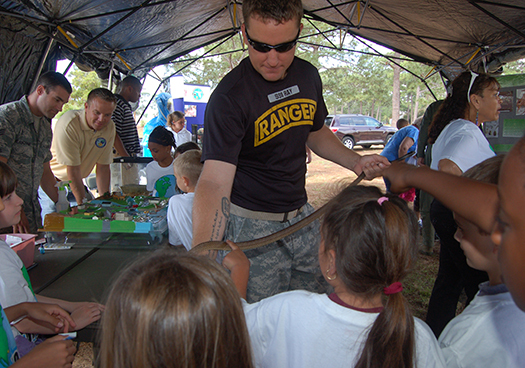 Okaloosa SCIENCE has many upcoming exciting programs and fun events throughout the school year! To find out more, check out our calendar. Want to stay connected to Okaloosa SCIENCE while you are on the go? Follow us on Facebook and Instagram to learn about the latest and greatest things happening with Okaloosa SCIENCE!